This series of five videos is a complement to an earlier, four-part series produced by the Forum of Federations in 2014: Gender-inclusive in the Middle East and North Africa. This new series takes a broader perspective. 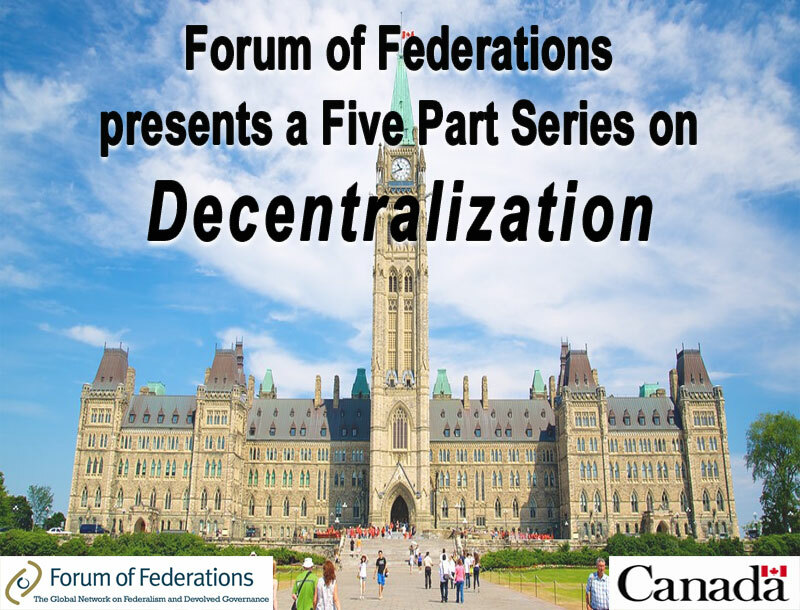 It endeavours to show how both central or national governments and sub-national institutions of government, of various types and forms, are necessary for democratic governance in decentralized countries. The series focuses on four countries. Two have had their decentralized-and, as it happens, also federal-systems since the mid 19th century: Canada and Switzerland. One achieved a peaceful transition to non-racial democracy in the 1990s, and is now significantly decentralized, although not formally federal: South Africa. The final country is now at the early stages of its own decentralization process: Tunisia. There is also an over-arching introduction, which describes some of the essential features of countries that maintain strong and vigorous national governments together with active and effective constituent unit and/or local governments. The purpose of this series is not to provide final answers to the issues it explores. You will find no simple recipes for success at decentralization here. The Forum hopes, rather, that people with an interest in these subjects will use the series to stimulate discussion, dialogue and learning. Each video in the series can be watched on its own, or you can watch the entire series in one sitting. For facilitators who plan to use the videos in workshops or training exercise-or for those simply screening the videos on their own-this Guide includes background and contextual information on the countries portrayed and suggestions for group discussion. Those are only suggestions. The Forum of Federations encourages those who use the videos as learning and teaching tools to be creative, and to apply their own knowledge and experience of the issues raised. Please make this educational tool your own.